Elements are all the abilities a Chrono Cross character has other than basic attacks and defending. They include everything an RPG usually categorizes as “magic” – attacks, healing, buffs/debuffs, status effects, summons – as well as consumable items and special mechanics like stealing items. In a game full of weird, unique systems, Chrono Cross‘ magic system might be the weirdest and most unique. …Actually, no. Next week’s system is even weirder. But boy are Elements wacky. Serge starts with three Element Grid slots, one each of level 1-3. The level 1 ± 7 Element Cure is equipped in the level 3 slot, meaning it gets a 50% bonus for being two levels higher than base and also allows Serge to build up 3 points of Power Level to cast it with. Image via lparchive.org. Each successful attack by a player character increases the character’s available Element Grid Power Level (as the manual refers to it; I’ll just use “Power Level” from now on) by the attack’s stamina cost – Weak 1, Strong 2, Fierce 3. Using any Element spends not just the 7 stamina we discussed earlier in the series but also the amount of Power Level corresponding to the level of the Element Grid slot to which the Element is equipped. Once acquired, Power Level is not lost until the character uses it or the battle ends. 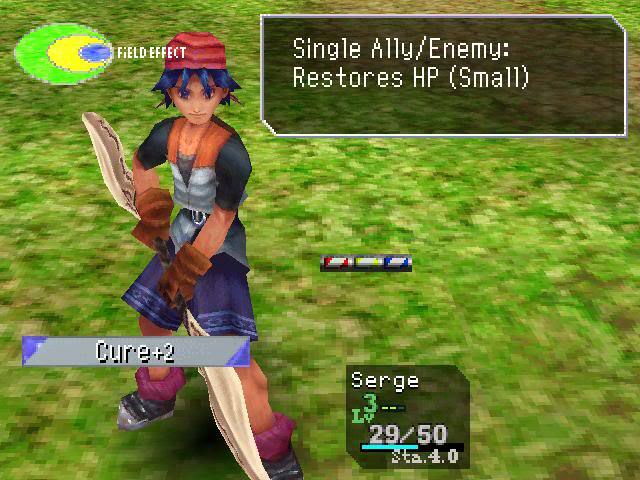 As I mentioned in my overview of CC late last year, having leftover Power Level at the end of battle allows the player to use any unused healing Elements automatically, which is an extremely smart bit of player-friendly design that allows individual combat encounters to be very difficult without causing fatigue over the course of a long dungeon. In that piece I also mentioned that the design decision to have each copy of an Element only be usable once per battle, and the resulting need for characters to eventually be able to equip dozens of Elements, leads to the biggest usability flaw in the whole game: managing the Elements equipped by a party of as many as 45 characters is impossibly tedious. It has another interesting consequence, however: the required Power Level of individual Elements can be adjusted as the player sees fit. 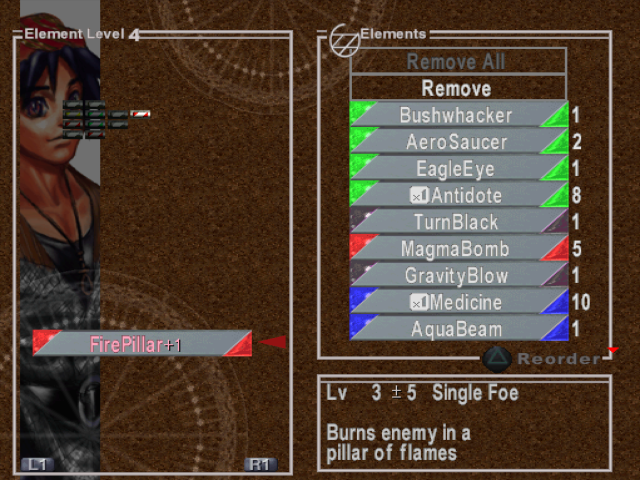 As the game progresses, each character gains more slots in their Element Grid, each slot having a level between 1 and 8. Each Element has a range of slot levels to which it can be equipped. For instance, Fireball’s level range is 1 ± 7, so it can be equipped anywhere; Inferno is 5 ± 3, so it can be equipped in any slot except level 1. In fact these level ranges follow a predictable pattern; apart from a minority of non-adjustable Elements with a range of X ± 0, which can only be equipped to their base level, every Element’s range is X ± (8 – X). This means adjustable Elements can be equipped at any level higher than its base level, but as base level increases the lowest levels become unavailable, until we reach level 8 Elements which can only be equipped at level 8. Serge a little later in the game, already showing off how unwieldy the Element allocation interface is. There’s a reason why the game won’t let you take a level 5 Element and equip it at level 1: for each level above or below the base, the damage dealt (or healed) is increased or reduced by 25%. (As usual this info comes from the invaluable mechanics guide on Chrono Compendium.) So that theoretical level 5 Element in a level 1 slot would be reduced to an output of 0. On the other hand, a level 1 Element in a level 8 slot will produce 2.75 times the effect of the same Element equipped at level 1. This is one of the best implementations of the concept of adjustable spell power I’ve seen in an RPG. Many games, ranging from Elder Scrolls IV: Oblivion to Final Fantasy XV, let you craft spells, but usually give you so many possibilities that choice paralysis sets in and choosing one formula over another feels like it has no consequence. What is it worth to a FFXV player to have the choice between using 39 fire energy in a spell instead of 40? The Chrono Cross ± mechanic offers just enough customizability to make interesting choices possible without overwhelming the player. It’s important to have some Element equipped in the highest slot available, no matter what, and not just because of the bonus effect a higher slot can provide: the maximum Power Level a character can accumulate in battle is equal to the highest slot level with an Element equipped. At the beginning of the game, if Serge only has one Element equipped in a level 1 slot, his Power Level will top out at 1 no matter how many hits he lands. As a result, it isn’t possible to build up enough Power Level to cast multiple top-level Elements in a row; if you use your best Element you will always start over from Power Level 0. By the endgame Serge has more than 40 Element slots and can build up to Power Level 8. Image via lparchive.org. Early in the game, this design decision pushes the player towards the cyclical pattern I’ve mentioned a few times of spending a full stamina bar to chain physical attacks together, dealing damage and accumulating Power Level, before casting an Element to end a turn. As you reach the late game, however, when characters have a few 8 slots and dozens of slots of levels 1-4, more often than not you will have Power Level remaining after casting. This makes all kinds of technical manipulations of the system possible; the player can attack just once to get a level 1 attack and cast immediately, or spend a full stamina bar to build up a lot of Power Level and then just cast low level Elements for the rest of the fight. Why might you want to open a late game fight by casting a piddly level 1 Element? 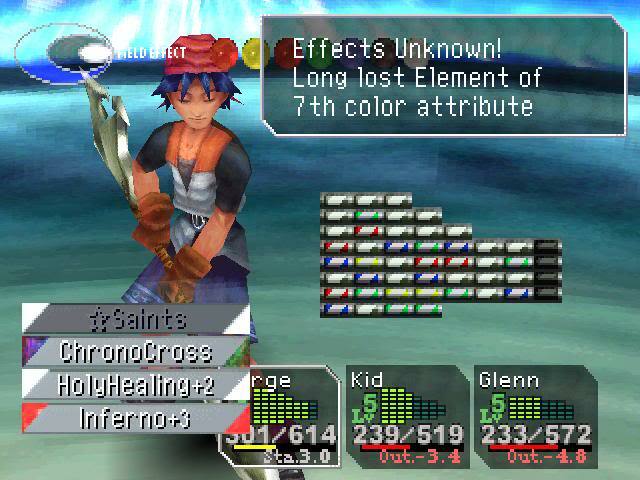 Because like everything else in Chrono Cross, casting an Element does several things, including manipulating a property called Field Effect that is influenced by the colors of the most recent Elements cast by both player characters and enemies. That system, and how colors interact in general, will be the subject of part 4.